This might sound like I’m trying to toe the party line. But I’m excited. Very excited. As I type these words, I think can actually hear a the faint sound of a printing press (I live in Wapping**) working overtime. 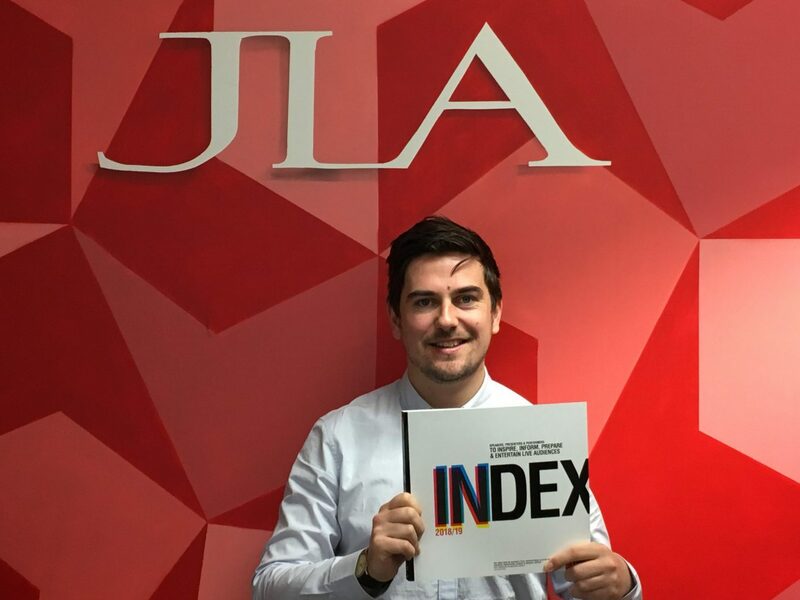 Yes, that’s right, the new edition of the JLA Index is about to hit your desk. We take a considerable amount of pride in the publication. Though it’s possible to book literally thousands of keynote speakers through your JLA agent, the Index is different. This is who we as an organisation have faith in, speakers we believe have messages that can change the way you think or how a business operates. Each JLA agent has a copy on their desk and we flick though it in the same way our clients do, looking for that killer keynote speaker to fulfil a brief. I’ve just flicked through the new edition and I think you’ll like it. Beautiful full page pictures of keynote speakers “in action” at your events, transcripts from JLA breakfasts and interview segments (Justin Webb on how US demographics ties into Trump in particular, is terrific). We’ve also got a specific section this year on the challenges and opportunities surrounding Brexit, and a dedicated chapter on the big trend I’ve noticed a huge shift towards in the last 12 months; AI, Robotics and Automation. When you receive your copy, you’ll find it a useful tool in your event planning armoury. Here are three keynote speakers I’d like to draw attention to in particular. By no means a new name to the JLA Index, but I can’t think of anyone I’d like to tell me what the hell is happening more than Robert. He made his name in the Financial Crisis of 2007, and since then has had a full range of economics, business and politics briefs on the BBC and ITV. It shows when he’s on the conference stage for our clients. He correctly predicted that the UK would leave the European Union and that there would indeed be a President Trump. He still gets his hands dirty broadcasting from political rallies on Facebook, engaging with voters across the political spectrum, and his new book WTF explains why we have changed our political landscape in recent years. For businesses looking to plan and FutureProof, surely there is no one better to guide us. One of the trickiest parts of our job as account managers is to convince a corporate client that a speaker with a slightly higher fee is worth the spend when they don’t have a huge media profile. But the moment I get an “Oh my God, I had no idea how good he/she was” call after an event is definitely the best part! Jonas is a speaker who engeders this reaction. Content wise it’s bang on; how to foster an innovative culture in a big organisation, how to disrupt and change a marketplace. He’s been there and done it all at Skype, but it’s the way he delivers these messages that impresses me. Here is the speech I always send to convince my clients it’s worth spending a little more to secure him. Injecting humour into daytime conference speeches is a risky business. The big joke to get everyone relaxed fails, then suddenly everyone is a bit on edge for the learning bit. We’ve all seen it. Fortunately, Timandra Harkness has the rare ability to give people belly laughs before imparting amazing wisdom on the future of science, technology, robotics and A.I. One of my favourite 2017 speeches was Timandra examining whether the male and female brains are actually wired differently. It was fascinating, but Timandra’s stand up background gives her the ability to lighten the tone throughout her speech. For anyone who hasn’t listened, her double act with Leo Johnson on Radio 4’s FutureProofing is a joy to listen to. 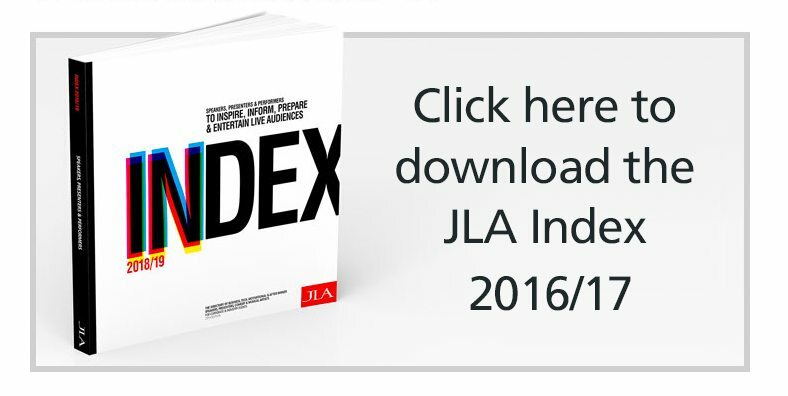 There are many, many new and exciting keynote speakers in the new JLA Index. We’d love to hear your feedback on it when it arrives on your desk.